Last week we learned the sad news that Lorna Levi passed away, less that two weeks after the death of her partner of 65 years, Herb Levi. She was 86. To you and Frances I send my condolences for the loss of Herb. I have so many memories of Herb, and many of them are also memories of you. Although I didn’t observe your relationship often, it was clear that your lives were deeply intertwined. It was hard to think of Herb without thinking of you, especially when I visited Pepperell, or when I thought of Herb working at his home laboratory from Wednesdays through Sundays. I imagine the little tortoise walking around between his feet. The two of you, your house, the land and animals and food that you nurtured, gave to me a way to think about how to build a life and a better world. That last sentence is very much how I thought of Lorna. Understated, with bright eyes holding a mischievous wit, full of the colours and textures of nature. She built not by cutting and imposing our straight lines, but by nurturing — plants, fabrics, and the pot of rich food on her stove. Oh, the multifarious Thanksgiving meals she put on for the “orphaned” graduate students in Herb’s lab! 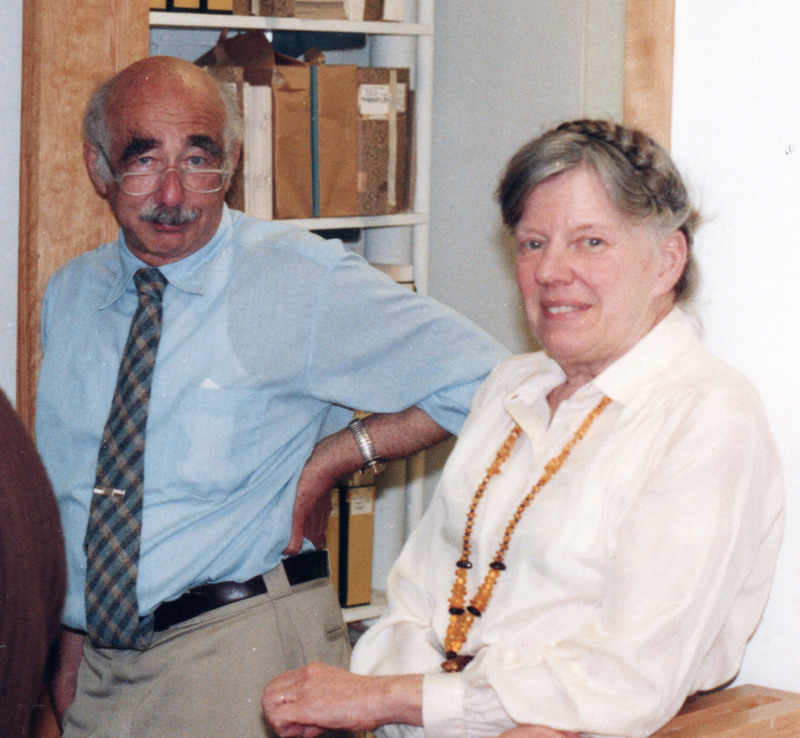 She was a partner in the background of much of Herb’s contributions as a spider taxonomist, supporting him in more than one way. There’s a story — I hope I have this right — of her helping Herb to get over the fence at some foreign museum unexpectedly closed, so that he could get in and look at important specimens. That is the image I am left with, Lorna being a tiny bit subversive and doing what needed to be done. 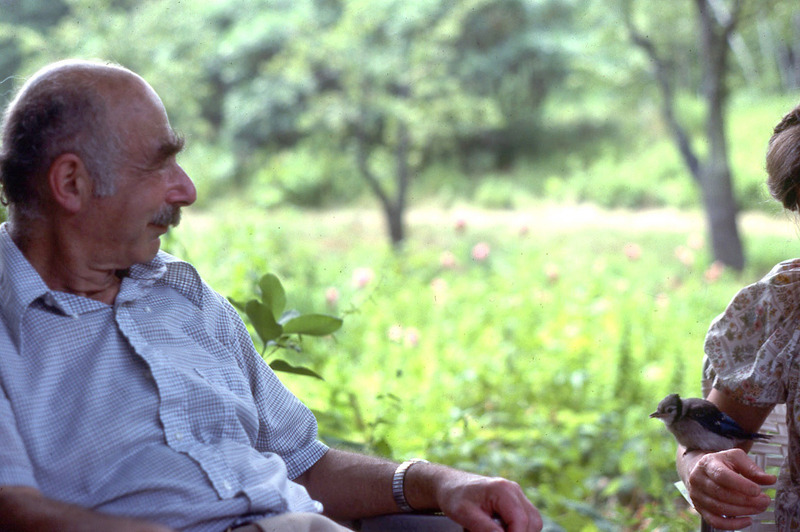 Herbert Walter Levi, one of the grand arachnologists of the 20th century, died on Monday 3 November 2014. He was my PhD supervisor, and the supervisor of many of our most prominent spider systematists (and non-systematists). I took the photograph above in the 1980’s when I was a grad student. At right you can just see his beloved Lorna’s arm with a blue jay on it. They are on their property out in Pepperell. Over his career, he described about 1200 new species of spiders, showing his commitment through tireless efforts on taxonomic monographs. Every species was to be described well, illustrated beautifully: every one was to be respected. As my supervisor, he provided for me a perfectly equipped laboratory in which to grow into arachnology, but mostly he was a role model: he showed me that it was OK to love your organisms, to become immersed in their diversity and to dedicate your life to them. Herb said that he hadn’t planned to be a taxonomist, but rather found that he couldn’t identify his specimens for the ecological work he intended, and hence had to divert into taxonomy, a diversion that lasted his life. His taxonomic revisions then enabled other biologists to write hundreds of papers on spider ecology, behaviour, evolution, and of course systematics. He taught not only the undergrads in his Invertebrate Biology course, and his graduate students, but also the public. He was author (along with Lorna) of the Golden Nature Guide “Spiders and their Kin”, which was my first spider field guide, when I was 13 years old. I remember once I walked into his office, and Herb was talking to his secretary. Apparently he had forgotten to do some bureaucratic task, and in dismay, he slapped his forehead and exclaimed “Och, my head is full of spider genitalia”. Truly, it was. And that was what was marvellous about him. He illuminated his cherished spiders for us. We have more than 1200 reasons to remember him for the next few centuries. It’s often the case that in the course of completing a major release for a piece of software, various changes you make don’t have a chance to “settle in comfortably” by the time of release. And so, over the next few weeks, you discover bugs or bad performance that was introduced with the changes you made — “unanticipated consequences”. As usual, this happened with Mesquite 3, and so we have released Mesquite 3.01. Some of the fixes resolve performance issues in 3.0, some avoid crashes. We also added a couple of new features. You can get it at the Mesquite website. Our collaborative paper, with Daiqin Li and our respective colleagues, on the molecular phylogeny of salticids has come out! We’re thrilled to publish these data using standard Sanger sequencing before the deluge of genomic data comes out. If we had waited a year, people would have expected hundreds more genes! 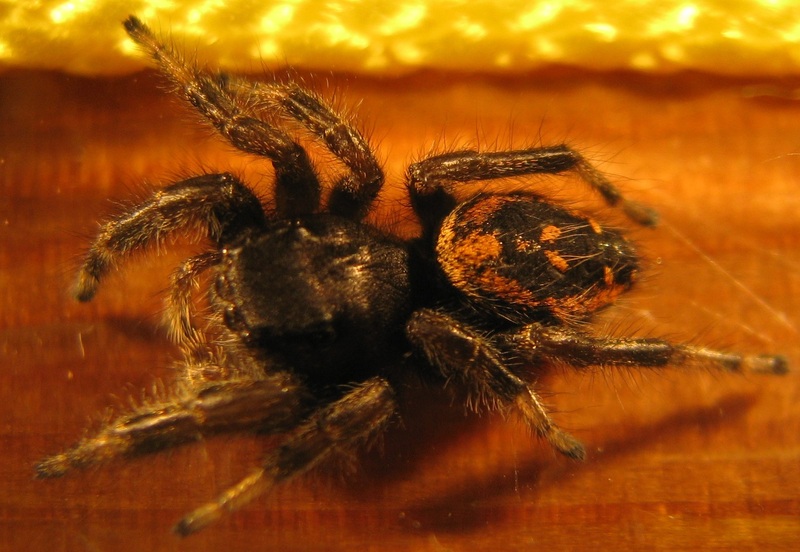 Nonetheless, our data from 8 genes has contributed to a firmer resolution of salticid phylogeny. There are still some areas with poor resolution, but it does seem that we are figuring this out. I’ve prepared a version with the supplemental materials already embedded (and the tables rotated for ease of online viewing), here, but you can get the original basic version here. Maddison WP, Li D, Bodner M, Zhang JX, Xu X, Liu Q, Liu F. 2014. The deep phylogeny of jumping spiders (Araneae, Salticidae). Zookeys 440: 57–87. David and I released Mesquite 3.0 today, which has used up a lot of our focus over the last few weeks. We’ve revamped the interface, fixed a lot of bugs, and added new features. It’s been three years since the previous release. We think biologists will be happy with the improvements. Our paper describing Jerzego is out! 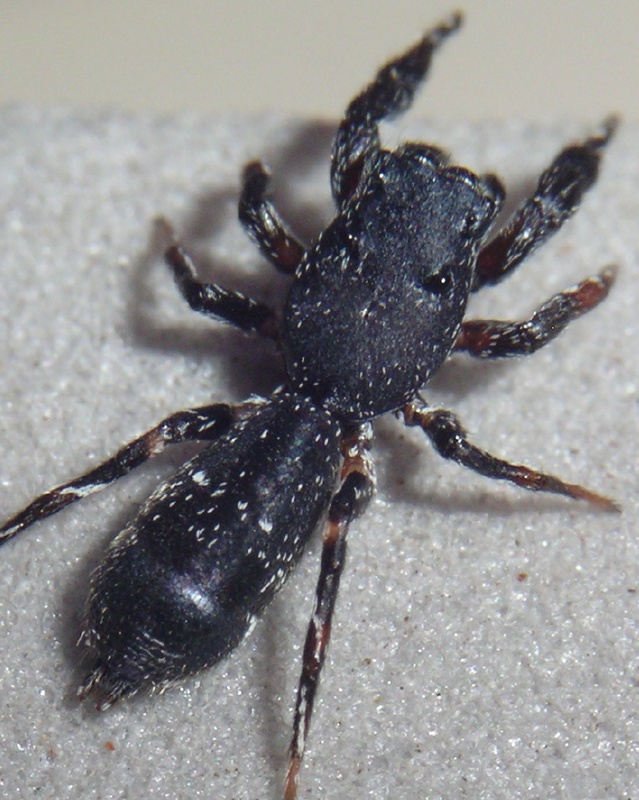 Jerzego is a strange flat jumping spider, from the interesting subfamily Hisponinae. Edy found both specimens of Jerzego corticicola on tree trunks in Borneo. We named it Jerzego in honour of Jerzy Proszynski. Junxia Zhang’s and my paper on Tisaniba is out! 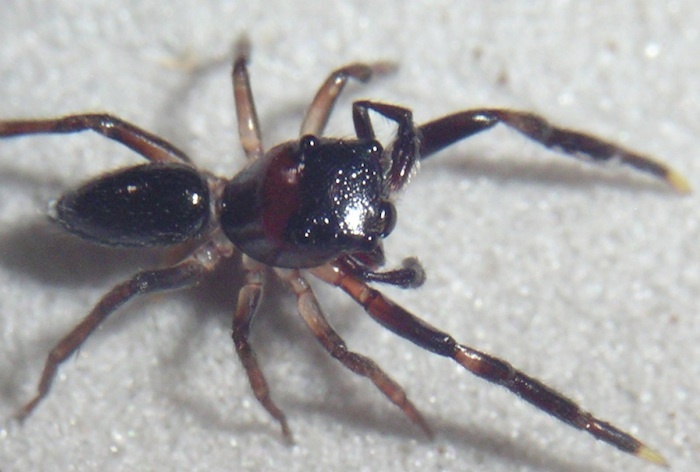 This is a genus, newly discovered, of small dark shiny jumping spiders that live in leaf litter in Borneo. When we were catching them, we didn’t know what they were, so we called them “Tiny Shiny Blacks”. The generic name was chosen to sound a bit like that name. Last week, my dispersal-limited self was lucky enough to hitch a ride with Catherine Scott, Sean McCann, Gwylim Blackburn, and Samantha Vibert, to hunt some spiders along Iona Beach. You can read Sean’s blog post (with much, much better photos than I took) summarizing our short evening field trip in rather gloomy, chilly conditions not conducive to salticid-wrangling, but I wanted to relay a particular tidbit that I learned from that trip. As we explored the habitat above, Catherine and Samantha uncovered not one, but two Phidippus johnsoni residing together in what appeared to be a single little silken retreat on the underside of a log. I collected both–a male and then a female (pictured below, respectively)–harboring in mind Sean’s suggestion to film a mating trial. Afterwards, I took to the internet to read up on the Phidippus mating game. 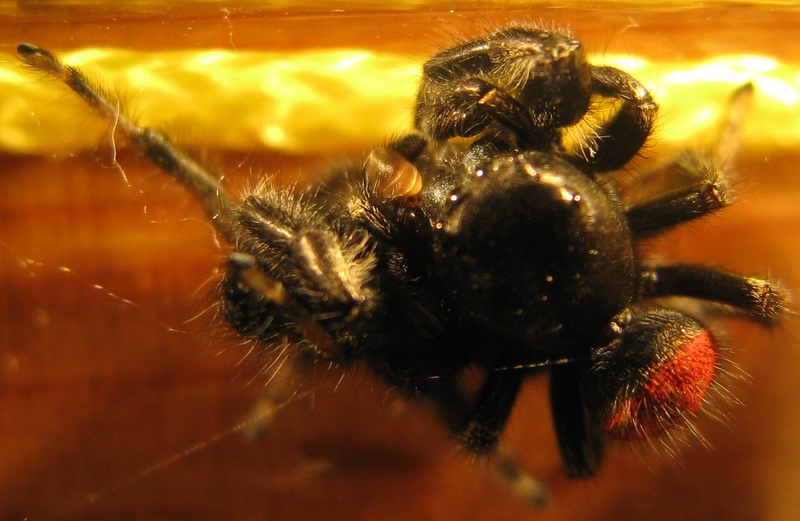 Much has been written about Phidippus mating strategies, including those of P. johnsoni, and males’ guarding sub-adult females is well-documented. 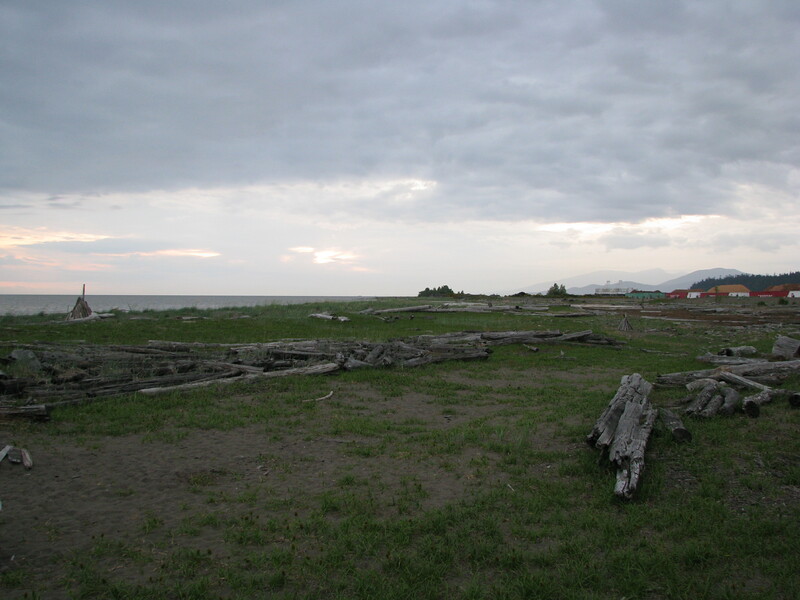 Apparently the single silken retreat we discovered at Iona Beach was in fact a two-story townhouse of sorts. In preparation for her final molt, the female built a retreat. The male, upon encountering her, likely courted her by tugging at her retreat, and subsequently built his own abode on top of hers. Interesting that courtship can take place before the female has even matured! Of course, placing our subjects together in a vial elicited a different, more visual mode of courtship, as you can observe in the first video. So there you have it. Even the shortest field trips in rather unfavorable weather can yield new natural history lessons. * Hoefler, Chad D. 2007. 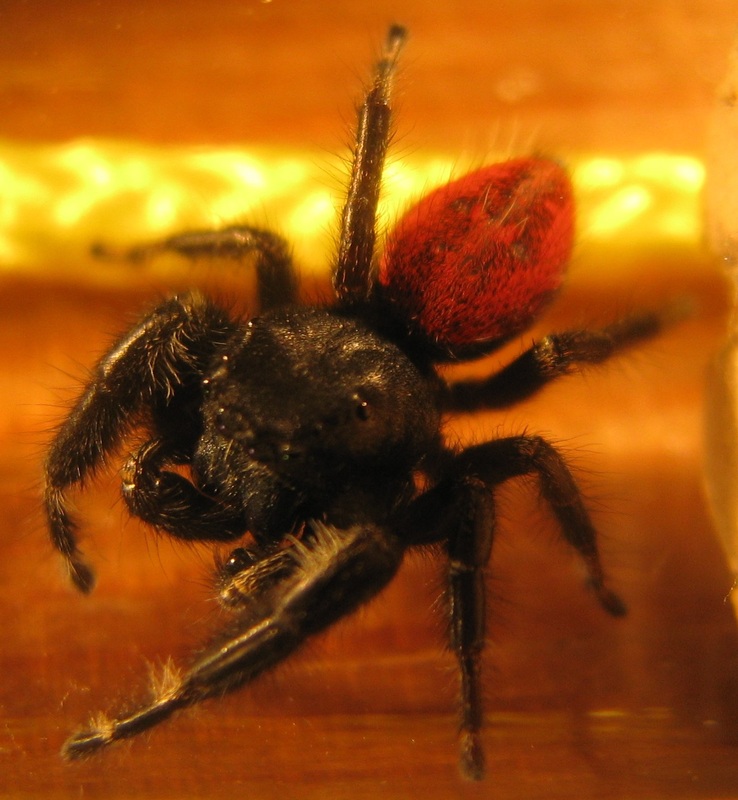 Male mate choice and size-assortative pairing in a jumping spider, Phidippus clarus. Animal Behaviour 73:943-954. 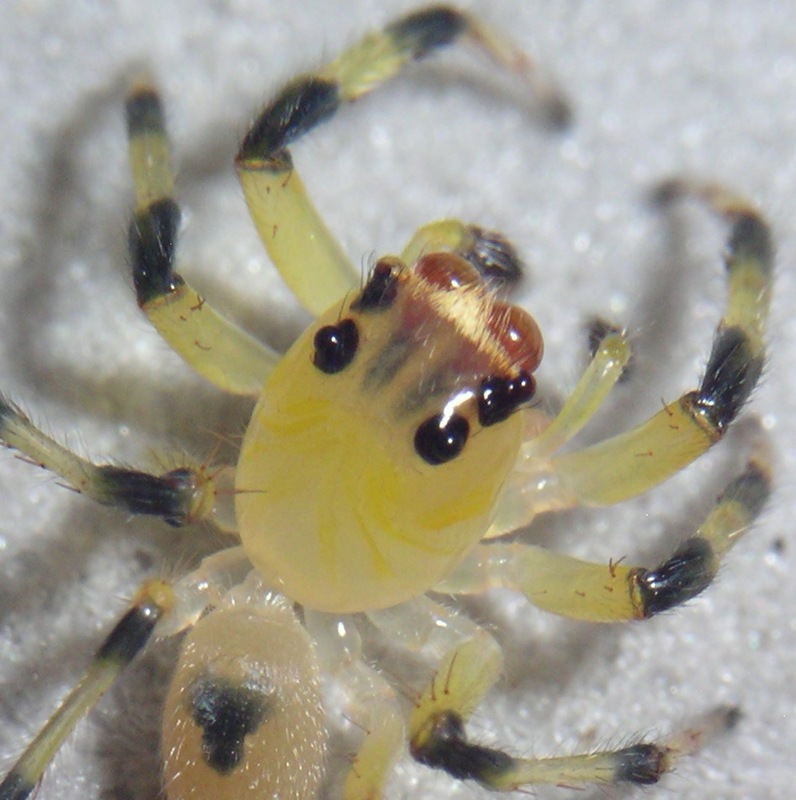 In previous posts I’ve shown the unusual spotted pattern inside some Habronattus males’ eyes, and you’ve seen the moving eyes of the transparent yellow amycine jumping spider. Here I’ll combine the two to show you what the spotted patterns look like in a living male Habronattus aztecanus. And now to the video. I managed to get this video’d just yesterday, by pulling a piece of transparent plastic film over a live male to hold him down so that I could get him under the microscope. Enjoy! 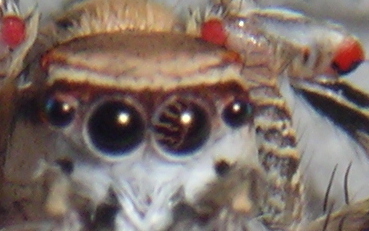 Last week my old video on moving spider eyes went fungal (that’s a bit slower than viral), following its linking from Gwen Pearson’s Wired column, then io9, then reddit. In honour of its recent fame, I repost the story that introduced the video, from my now-lost blog at the Beaty Museum. In Canandé we found the most remarkably transparent jumping spider I’ve ever seen. It’s an amycine, but I don’t know exactly which one. Here is a close-up of the male’s body. At the back of the carapace, you can see the muscle bands for each of the legs, separated by yellow, which may be the blood pooling. You can also see the eyes quite clearly. The black patches on the head are the smaller side eyes, but the main eyes extend like cones backward from the face. In the living spider you can see these cones move as the spider is looking in one direction or the other.